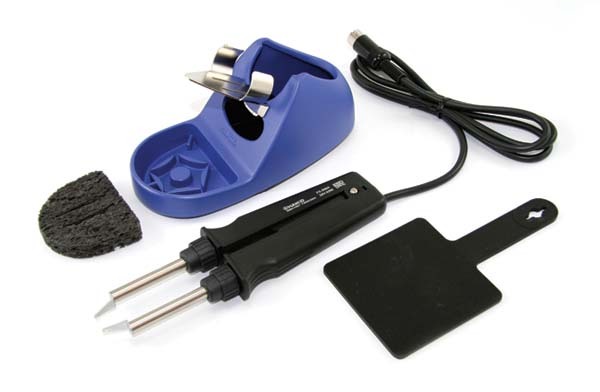 The Hakko FX-8804 hot tweezer is great for removal of surface mount components. For use with the FX-888, FX-888D, and FX-889 soldering stations. The FX-8804 Hot Tweezer delivers direct heat to the component, preventing damage to surrounding components on dense boards. It easily removes SMD chips and flat packs up to 25mm. The collet allows easy replacement of tips. The Hakko FX-8804 is compatible with the Hakko FX-888, FX-888D and FX-889 soldering stations..
FX-8804 Hot Tweezer Holder Use the FX-8004 hot tweezers for SMD rework with the FX-888D soldering station..